The percutaneous insertion technique requires surgical skill and experience. 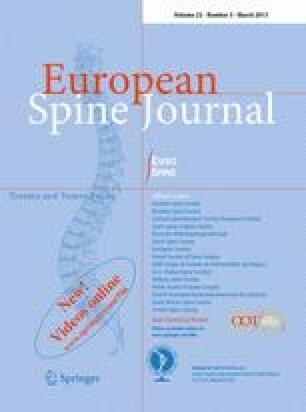 However, there have been few clinical reports evaluating the accuracy of minimally invasive pedicle screw placement using the conventional fluoroscopy method. The purpose of this study was to evaluate the accuracy of percutaneous pedicle screw placement in the treatment of thoracic and lumbar spine fractures using two-plane conventional fluoroscopy. A prospective clinical trial was performed. A total of 502 percutaneous pedicle screws in 111 patients, all inserted with the assistance of conventional fluoroscopy, were evaluated. The safety and accuracy of pedicle screw placement were based on the evaluation of postoperative axial 3-mm slice computed tomography scans using the scoring system described by Zdichavsky et al. [Eur J Trauma 30:234–240, 2004; Eur J Trauma 30:241–247, 2004]. 427/502 pedicle screws (85 %) were classified as good and excellent concerning the best possible screw length and 494/502 (98 %) were found to have good or excellent position. One screw had to be revised due to medial position with a neurological deficit. This study demonstrates the feasibility of placing percutaneous posterior thoracolumbar pedicle screws with the assistance of conventional fluoroscopy. Minimally invasive transpedicular instrumentation is an accurate, reliable and safe method to treat a variety of spinal disorders, including thoracic and lumbar spine fractures.